UNIVERSAL COMPATABILITY - Compatible with iPhone 6, 6S, 6 plus, SE, 5S, 5C, 5, 4S, 4, iPod touch, Samsung Galaxy S2, S3, S4,S5, S6, S6 S7 Edge, Note 2, 3, 4, 5, 6, Nexus, Nokia Lumia 920, LG G2, G3. G4, G5, Optimus G, HTC One X, S, M, BlackBerry, Sony Xperia and all smartphones and phablets up to 6"
This is truly a convenient cool gadget that you don't want to miss !!! Huiker® magnetic car mount holder easily holds your smartphones or phablets at any orientation for a convenient viewing angle with a residue free stability. It's absolutely hands-free and do not block the view of windshield! You can use it as a cell phone holder, an easy-to-use GPS navigation or your one-stop-solution for safely calling your loved ones & using apps like FaceTime, Skype, Maps, while driving! Powerful neodymium magnets hold your mobile phone in position tightly, regardless of bumps in the road! It is also case friendly for any slim/thin cases. Just apply the complimentary metal plate onto the back of your smartphone or inside the smartphone case cover & place it on the magnetic mount. 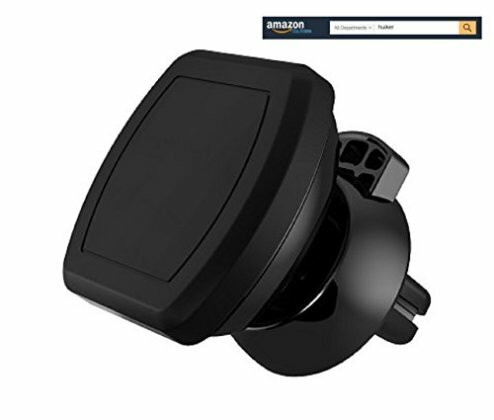 The grip base firmly holds onto the air vent (between 1.5mm - 5mm width) so you have full view of your windshield at a convenient viewing angle! Virtually compatible with all smartphones and phablets in the market including iPhone 6 6S Plus 5S 5C SE, Samsung Galaxy S7 S6 S5 S4 S3 Edge Note 5 4, LG G5 G4, Google Nexus 5x 6P, HTC, and all other Android, Windows & Blackberry smartphones and small phablets (below 6-ounce). Great gift for Father''s Day! So order now by clicking the above "Add to Cart" button. This cool gadget will surely make your life much easier !! !